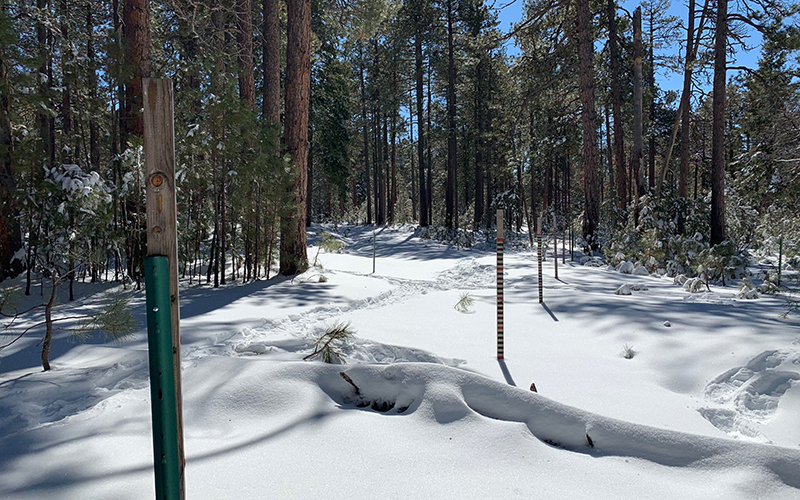 GREELEY, Colo. – High snowpack in the southern Rocky Mountains this winter will likely stave off a shortage declaration in the Colorado River watershed in 2020, relieving some pressure on water managers attempting to navigate future scarcity. New data from U.S. Bureau of Reclamation models show a lessened risk of Lake Mead dropping far enough to trigger the first shortage declaration since the reservoir was built in the 1930s. Snowpack in the Upper Colorado River Basin is at 138 percent of the long-term median, a level not seen in mid-March since 1997. Forecasts for Lake Powell on the Arizona-Utah line have improved since early February, with the reservoir expected to see 92 percent of average inflow through the end of September. But federal officials are quick to remind people that one wet winter won’t solve the Southwest’s structural water problems. A shortage declaration is tied to the level of Lake Mead, the nation’s largest reservoir and a key water source for California, Arizona, Nevada and northern Mexico. If it drops to an elevation of 1,075 feet above sea level at the beginning of a calendar year, the federal government can declare a shortage, forcing some users, mostly in Arizona and Nevada, to make due with less. In the latest Bureau of Reclamation model, Lake Mead’s surface elevation is projected to be at 1,080 feet at the end of 2019. Lake Mead, which NASA estimates now is about 37 percent full, has been flirting with 1,075 for years. A combination of voluntary cutbacks among big water agencies in the Southwest and sufficient snowmelt has kept the reservoir from dropping below the shortage threshold. This winter’s extra moisture gives some flexibility to Colorado River water managers currently trying to wrap up Drought Contingency Plans, a portion of which requires congressional approval and a presidential signature. Arizona and California have been the holdouts on that multistate deal. Both states missed a series of federal deadlines meant to speed up agreement on a series of steeper cutbacks should reservoirs continue to drop.